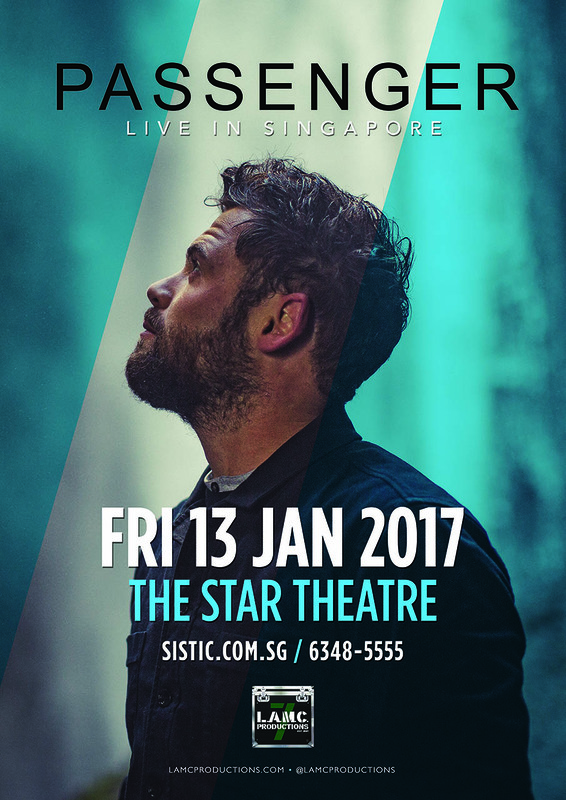 LAMC Productions is pleased to announce that renowned English singer, Passenger will perform LIVE in Singapore for the FIRST time on January 13, 2017, 8pm at The Star Theatre, The Star Performing Arts Centre. Passenger is best known for the phenomenal worldwide hit “Let Her Go,” from the album, “All The Little Lights”, which has captured the imagination of the listening public all over the globe, hitting #1 in over 20 charts worldwide. The accompanying video just joined YouTube’s elite The Billion View Club, only the 23rd music video to do so. The song received a nomination at the Brit Awards for “British Single of the Year” and the British Academy’s Ivor Novello Award for Most Performed Work in 2014. Passenger will be bringing his brand of reflective and relatable pop indie-folk music in what promises to be an intimate and memorable concert. Rosenberg co-founded Passenger as a five-piece band in 2003 before releasing their only album in 2007 and breaking up in 2009. With the dissolution of the band, Rosenberg decided to stick to the name and perform as a solo act, even resorting to busking on street corners to make ends meet. He moved to Australia in 2009 where he started getting his stride back, packing 500-seater shows and releasing his first album as a solo act Wide Eyes Blind Love. He then released his second record “Flight of the Crow” in 2011 before making his biggest breakthrough when he released his third album All the Little Lights (which included the aforementioned hit “Let Her Go”) in 2012. Passenger toured with the likes of Jools Holland and Ed Sheeran (the latter of which was a friend of his in Cambridge at the young age of 15) and before he knew it, “Let Her Go” was being used in various movies and TV shows and amassing over a billion hits on YouTube. He has since released two critically-acclaimed albums, Whispers (2014) and Whispers II (2015). He spent the next two years playing sold-out shows across the world and demanding the attention of thousands upon thousands of festival goers with only his voice and acoustic guitar.